Okay guys, as you know (or I hope you do) we love to amp up the style in our home with architectural elements. So, when it comes to our stair project the newel posts were a really important feature. I wanted big and chunky- no skinny “model sized” newel posts for me- give me some meat! I know I haven’t shown you the final… I am still working on finishing caulk and extra coats of paint, but we were asked a while back on how we built our newel posts. I passed the job on by asking my handy hubby to make a tutorial up for you all! He broke the project down into 10 simple images to show you the steps he took to accomplished the look that we wanted -simple, yet elegant. Now this may or may not be the “correct” and “proper” way to build a newel post, but it worked for us and they are super solid and easy to make happen.. so there you go! Feel free to use our ideas and make a beautiful version of your own, ***all I ask is that you please link back to this tutorial if you blog about it AND I wanna see what you do, so please just be sure to submit them to be featured! Please let us know how yours turn out. We would love to share it with everyone. On to the -uh- quasi tutorial! Don’t use pressure treated 4×4’s for the core- whoops! We thought we would save $10 by buying it, but regret using it. They shrank and twisted. Justin was able to work around it but it took a lot of thought and patience. That is one reason that I used the spacers, but mine were all different sizes to make the shell of it all be centered and square. Don’t wait too lang to install your new newel posts. They add so much to the end of the stairs and are great to look at rather than what we looked at for 2 years! Thanks so much for taking the time to draw up these plans! I have dreams of making over our ugly 1970’s staircase, and would love to have newel posts like these. This makes me think that maybe, just maybe I could do it! I am so glad! GOOD LUCK! You can totally do it! Cassity, I am trying to find your kitchen cabinet headboard tutorial but it’s not here. Can you please let me know where I can find that? Thanks so much! You two are so very talented.!!!! yea! Good luck! If you do it please send me a link! LOVE your entry!!! LOVE the tutorial and professionally done images!!! You guys are awesome! Thanks for such a detailed tutorial! It looks amazing. I want to feature this post in a story I am working on for Houselogic. I sent you an email too. Can you please shoot me an email? I have a few questions, thanks! Cassity, I really like your Newel post as well as all of the Architectural details in your house. Do you mind giving me an estimate of the cost to build just one of those newel posts? So you could do this project for about $60-80 dollars! Thank you so much for the inspiration! We’ve been researching the best (and cheapest) way to remodel our 20 year old stairwell for over 1 year now. We are scared to death to mess it up, but here we go! Your tutorial is simply amazing, and now we’re ready to tackle the project! I’ll be sure to send you pics of before & after. Best wishes :). Yes! Please send me pictures I would love to see what you are working on! GOOD LUCK! Hey, kids! Wondering how you did the long miter cuts? I have a table saw, but it doesn’t tilt to cut long miters, so I’m not sure how to get those nice mitered corners on the MDF. Thanks! Derek, we did use our table saw, since it has the ability to tilt the blade. If you don’t have that function on your saw, you could always do a butted edge I would just have the front be a full piece and the back be a full piece. The sides will just need to be shortened to, the current width minus 2 x the width of the MDF you are using. Also you could add a panel like this newel post that my friend did in her home. Hello again! So, while waiting for the conditioner to set on my new barndoor baby gates, (Thank you again! ), I decided to play around on your site. I am so excited! As soon as I finish staining and hanging my new gorgeous baby doors, building a coordinating sliding barn door for the other kitchen opening, and building that cool shoe storage shelf, I am going to do the exact same thing to my stairs! Believe it or not, our stairs, (pre-remodel for you), are nearly identical! There are three differences though. One, mine are swapped, we have a door to the left of our stairs. Two, we only have two stairs past said door. Three, our treads are not cheap pine, they are cheaper plywood! So, I will be painting them gloss black! I will not be discouraged! My concern is that darn door so close to the foot of the stairs. We have only 7.5 inches between the edge of the stair and the edge of the moulding. Do you know how far past the newel post the lowest stair protrudes? Do you have measurements for the stairs posted somewhere? Thank you for another great inspiration and tutorial! Amy, sounds like you are really busy. That is great that you are making all of that. About the stairs, I don’t have the measurements, but it looks to be about 11-12″ past the newel post. I hope that helps. Thank you so much for posting this, I am so hopeful that my husband might actually be able to give me this in our new house!!! You guys are amazing! Thank you Kerry and good luck with your new home! Beautiful! Can you tell me how you mounted the newels to the stairs? Kelly, you can see in this post here, how I did it. 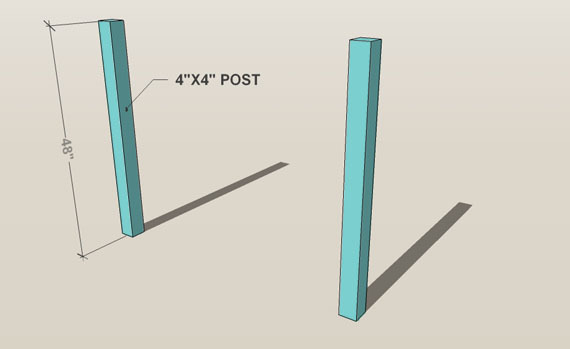 Make sure not to use pressure treated wood for the 4×4 post. I did and it warped. Just keep that in mind. I just love this transformation! You are a couple of geniuses over there 🙂 We recently redid our stairs and I had to use your staircase as an example before he would agree that we could do it ourselves. We didn’t have a stair skirt either and instead had carpet where it should be (yup, up the wall!) Thanks for the inspiration! I would love to link back to your page when I write the post about our staircase remodel! Thanks for the nice comment. We would love a link back when you write about yours. The transformation is stunning! When we did our staircase remodel, I had to show my husband your tutorial before he would jump on board 🙂 I’m hoping to write a post about what we did soon, and would love to link back to yours to showcase our inspiration! Thanks again for yet another awesome tutorial! Your blog never disappoints!! Thanks for the nice comment. You can absolutely link back to us. First let me say…y’all have done a fabulous job! Want to come to my house and fix my stairs for me? Kidding…kind of! 🙂 Just a quick question, on the newel post plans what are the dimensions for your base cap (I can’t read the number no matter how hard I squint at my screen), and was that something you purchase precut and if not how did you cut the square out of the middle?? Thanks! Kara it is a pre cut post cap for a 6×6 post. I’ll be doing this over the weekend. Going to go with a different look. I have put raised panels on the walls at 4 ft all over the house. So I am going to go with a square insert here. Hopefully it turns out. Josh, good luck with the project. Let us know how it turned out. This is gorje! I do have a question about your banister: did you refinish your original banister or buy a new one? And what change in it did you make – I can’t tell for sure, but it looks like you painted it black, is that correct? Yes, we just painted the handle black and gave original spindles a coat of white paint. That was it! I am from Guyana, South America. I love this idea, but it is for an external freestanding stair. I am a bit worried about the banister. I will have to make two. Any ideas on how to accomplish the S shape to accommodate the wider bottom to the narrower top. The rain will not be too kind on the joints. Thank you. Is the base cap mdf? Is it something you cut or did you but it premade?